Negative adverts may be disliked by the public but positive campaigns are less likely to impact voting behaviour. Opinion polls are often misleading. For many years they have understated Conservative support. During the 1980s and early 90s most people told pollsters that they didn’t want tax relief but the lower tax Tory party kept winning elections. But, perhaps, the most misleading message from opinion surveys has been about negative campaigning. Surveys consistently suggest that the public hates negative campaigning but, despite this, politicians keep using negative campaigning. More than three-quarters of 2004’s spending by Bush and Kerry was on negative adverts. Are Bush, Kerry and other politicians crazy? Or do they know something we don’t? One of the things politicians probably know is that voters aren’t inclined to believe positive things that politicians say about themselves but they are inclined to listen to negative things they say about their opponents. All of the most memorable political ads are negative. 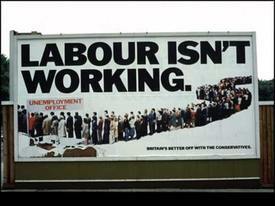 In 1979 there was the Tories’ Labour Isn’t Working campaign. 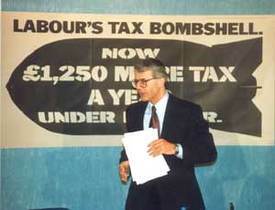 In 1992 the Labour’s Tax Bombshell and Labour’s Double Whammy campaigns produced an unlikely victory for John Major. In 2001 an ad portraying a bald William Hague with a Thatcher hairstyle worked for Labour. Negative campaigns aren’t sure to succeed, of course. 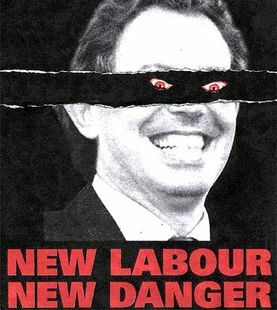 The Tories’ 1997 campaigns which portrayed a devilish Tony Blair were widely dismissed as over the top. Tony Blair was still in his Bambi phase. More recently an ad from New Labour that caricatured Michael Howard as Fagan backfired when Jewish groups found it anti-Semitic. The most successful negative campaigns are about policies rather than personalities. The Labour’s £1,000 Tax Bombshell campaign said something worrying about what a Labour government would take from the family income. Strong personal attacks can say more about the author of those attacks than the object of those attacks. When Liam Fox made a February 2005 attack on Cherie Blair he intended to wound the Prime Minister’s controversial wife. Dr Fox’s attack risked adding to doubts about his judgment, however. Many voters disapprove of personal attacks and whilst politicians may be fair game they think that their family should be off limits. This is one reason why risky attacks are best made by surrogates within the webroots - like the Swift Boat Veterans. The strongest attacks on John Kerry (during America’s 2004 election) weren’t made by George W Bush. Bush needed to protect his likeability and presidential ratings. Mayor Rudy Guiliani was Bush’s attack dog and if he went over the top it was easier for Bush to distance himself from the fallout.